While these seem to be in plentiful supply, finding one in mint or near mint condition can be a challenge. 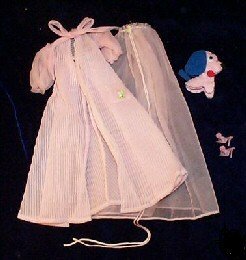 The fragile sheer tricot nightgown doesn’t hold up well and is prone to picks and snags. Also the long ties, meant to be tied in a Grecian style are frequently missing. The robe is a sturdier fabric and is easier to find in great condition. The pink shoes are often missing one or both pompons. The stuffed dog is adorable and is easy to find. The cloth Barbie tag should be in the neck of the robe. Skipper's coordinating ensemble was Dreamtime #1909 (1964 - 1966) .